Spring and summer flower season on Mt. 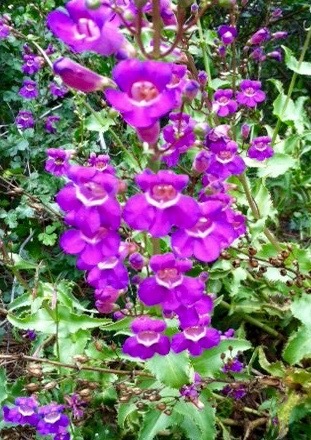 Laguna always includes some spectacular examples of the penstemon family. 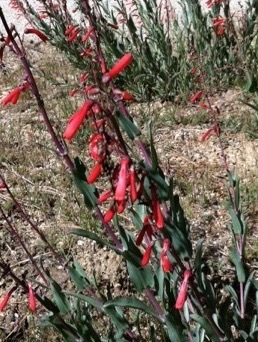 The American West has approximately 200 varieties of penstemon. I’ve only managed to find two on our mountain. If anyone has spotted others, please let me know. Penstemons have leaves that are lanceolate and opposite. The base of the leaf may hug the stalk in some varieties. Foliage varies from green to gray. our dry mountain habitat. The leaves are narrow, gray and waxy. Flowers are red and tubular, in tall racemes. This penstemon is pollinated primarily by hummingbirds, so watch for them nearby when the flowers are in bloom. Find it along Los Huecos Road or any of the trails throughout the mountain, blooming in May through July depending on the weather.our dry mountain habitat. The leaves are narrow, gray and waxy. Flowers are red and tubular, in tall racemes. This penstemon is pollinated primarily by hummingbirds, so watch for them nearby when the flowers are in bloom. Find it along Los Huecos Road or any of the trails throughout the mountain, blooming in May through July depending on the weather. The other penstemon I’ve found is the Showy Penstemon (Penstemon spectabilis). I’ve only seen it in one place—along Pine Creek Road about ½ mile from Sunrise Highway. It was about 3 feet tall, with tall stalks of gorgeous purple flowers. Again, this is a drought tolerant plant, growing in chaparral and dry mountain woodland areas. It’s worth a trip to find it—it really is stunning. The one shown here was blooming in mid May. Another penstemon is listed for our area, the Cleveland Penstemon, (Penstemon clevelandii). This penstemon has pink to purple flowers with grayish green foliage. It is said to grow in the coastal mountains of Southern California, so we should have some examples although I haven’t found them yet. The Indians of the southwest, including the Chumash, and probably the Kumeeyay, used the local penstemons externally for their wound healing properties. They would make a poultice of the leaves and flowers to apply to sores, wounds, insect bites, and other skin problems. The plant has certain glycosides and alkaloids that have wound-healing properties and are also anti-inflammatory, antimicrobial and antiviral. Celia Garcia, a Chumash medicine woman, reported that penstemon was also used for grief issues, although she didn’t indicate how it was used. Penstemons are so beautiful, simply contemplating the plant could probably help. Have fun stalking penstemons in this flower season! Garcia & Adams (2005). Healing with Medicinal Plants. Abedus Press, La Crescenta, CA. Kane, C. (2011). Medicinal Plants of the American Southwest. Lincoln Town Press. California Penstemons that grow in dry areas (edited Jul 11, 2013). Retrieved from www.laspilitas.com on June 1, 2015.